“Its intrinsic values such as teamwork, fairness, discipline, respect for the opponent and the rules of the game are understood all over the world and can be harnessed in the advancement of solidarity, social cohesion and peaceful coexistence,” added Dr. Marwah also Patron to IFUNA- Indian Federation of United Nations Associations. 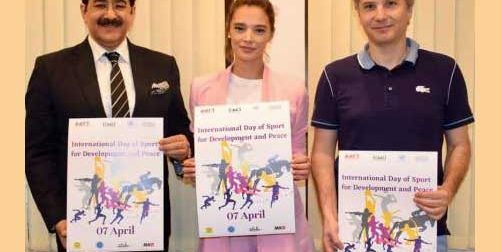 “Sport programmes permit encounters on neutral territory and in an environment where aggression can be controlled, regulated and transformed and hence facilitates rapprochement and reconciliation between opposing parties,” said Alex Teodorescu a film maker from Romania at the function while releasing the poster to mark respect to the day. “Although sport alone cannot stop or solve an acute conflict, it represents a flexible and cost-effective medium for post-conflict relief work and peace building as well as conflict prevention,” said Andra Axentoi film promoter from Romania at Marwah Studios. “Sport is also an important enabler of sustainable development. We recognize the growing contribution of sport to the realization of development and peace in its promotion of tolerance and respect and the contributions it makes to the empowerment of women and of young people, individuals and communities as well as to health, education and social inclusion objectives,” a message by Secretary General United Nations read by Sudhir Ranjan of AAFT University of Media And Arts.